Le Gite au Chez has one bedroom with a double & a single bed, with room for a cot too. Downstairs is the kitchen/dining and sitting room area. The bathroom is also downstairs & has a basin, shower & lavatory. Le Gite au Chez is an ancient farmhouse which we have restored retaining the charm & exposed stone work. It is situated in a courtyard on an old farm in very tranquil surroundings. There are many walks from the property which are also mountain biking tracks. It has one bedroom with one double & one single bed. Also room for a cot. It has a tv. Entrance opens onto the flowered garden. The village of St.Vaury is 1km away where there is a small supermarket, a bakery & several small commerces ( 2 bars, 2 tabacs, 2 banks, charcuterie, post office, a pharmacie, a hairdressers). Ideal place for a quiet get away or house hunting as we are between Gueret & La Souterraine. Limoges airport (flights from Stansted, Bristol, Edinburgh, Luton, Liverpool & Southampton) one hour away and La Souterraine station is 20 minutes away where there are trains from Paris( Gare Austerlitz). There are 2 tennis courts in the village. Fishing lake 1km away. Plenty of lakes nearby for swimming in. Availability. : Lets are sat-sat but we like to be flexible if we can. We bought Le Chez in 1997 and moved here permanently in 2000. It took one man 2 years to restore the cottage, learning a lot in the process. Space & tranquility. Cycling/walking tracks run directly from the property. Surrounded by land which we own, much of it wooded. The bathroom is 2 steps down from the sitting room. Towels are not provided, they are 4 euros each to rent or you are welcome to bring your own. If you would like to rent bikes then let us know as we can give you the details of a bike hire company who will deliver them for the days you require. Evening meals available at 15 euros per person (including wine). Please order in advance. Smoking only allowed outside. In peak season we prefer to let by the week and from Saturday to Saturday but we like to be flexible if possible. We arrived late but we had a lovely greeting from the owners dog who came running over as soon as we got out of the car. Rachel and James were fab hosts making us feel at home, Rachel prepared lovley meal and we all ate together, chatting about all sorts, the gite was rustic and charming with a lovely comfy bed I slept so well, the stress just disappeared it’s a fab location for walking and nature with a village in walking distance for basic amenities and a restaurant with friendly owners who also made our stay special, anyone looking for peace and quiet with helpful friendly hosts this is the place, can’t wait to return again. 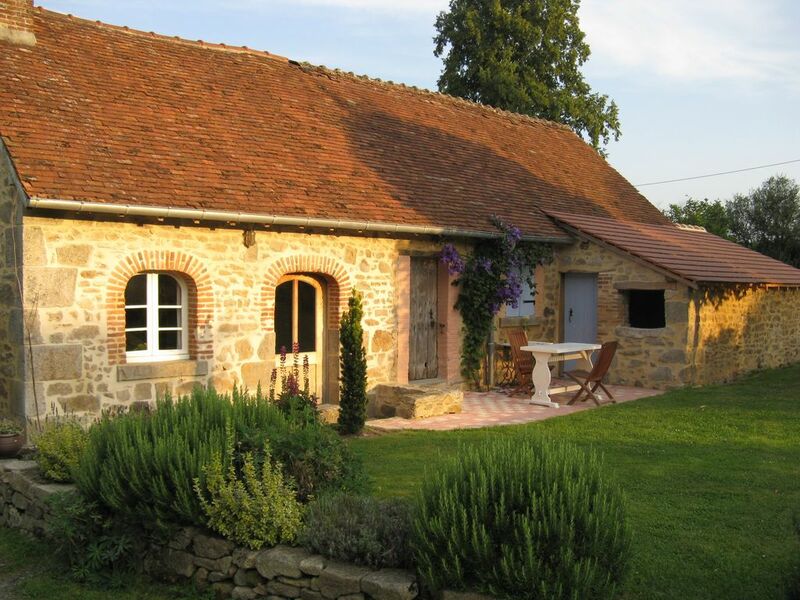 A beautifully kept gite with everything you need and lovely scenery too for walks and cycling. Rachel and Jamie are absolutely lovely and make you feel completely at home. Cette semaine en campagne creusoise a été bien agréable. Idéal pour se reposer et faire une vraie coupure ! Rachel et Jaimie les propriétaires de notre petit gîte sont très accueillants et nous ont bien conseillé pour nos balades. Si comme nous vous aimez la simplicité, l authenticité, le calme, la nature alors vous ne serez pas déçus ! Nous y retournerons sûrement mais avec nos vélos cette fois-ci ! We had the most relaxing and enjoyable holiday in this beautiful gite. From the moment you arrive, Rachel and Jamie make you feel so welcome and they couldn't be more helpful. The gite itself has been lovingly restored to feel cosy and rustic yet has everything you need, even down to the herbs growing outside! We had lots of lovely walks in the surrounding countryside which is as pretty and quiet as you'd hope and the village (only a short walk away) has a little supermarket and a bar. If it weren't for the fact that there are lots of other lovely places to go and explore, there'd be no need to leave! We'll definitely return! In a very charming and well renovated typical house, we spent a pleasant week. The owners, Rachel & James are very friendly. The region is nice, quiet, but at some places suffers from a lack of activity. The gites are on two sides of a courtyard in a hamlet in very tranquil surroundings, 1km from the village of St.Vaury where there are several small shops, a small supermarket, a bakery, charcuterie, post office, 2 banks, pharmacie. Gueret is 10km away where there are many shops and 2 museums. Eiffel bridge is 30 minutes away. Visit Fresselines & walk the Monet tour by the river where he did a series of paintings. Horse riding now in the village. cottage, farmhouse, gite, rural, calm, tranquil, quiet get away, cycling, birdwatching, rambling, hiking, fishing, horseriding, tennis, child friendly, VTT, mountain biking. On the 1st & 2nd July 2017 there's a Fete de Jeux in the village. On the 2nd there's a magnificent fireworks display. Lets are Saturday to Saturday but we like to be flexible if we can, so do ask if your dates are different. Easter-end of May 270 euros per wk. June & Sept. 330 euros per wk. July/August 400 euros per wk. October 270 euros per wk. Nov-Easter 190 euros per wk, (this rate does not include wood & electrics)l. Christmas and New Year by negotiation. Evening meals 15 euros when ordered in advance.